We visited Revlon to meet Judith Calzada Duaigües, an Alumna from the 2015 International Master in Marketing. Judith holds a graduate degree in Communication from Universidad Blanquerna, Ramón Llull. 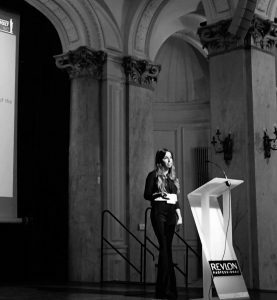 After working for various companies such as Freixenet and Audi VW, she joined Revlon where she currently works as EMEA Brand Manager for the CND brand. How has the International Master in Marketing helped you in your professional career? When I graduated, I realised that I wanted to enter the business world. My family has always been devoted to business and I wanted to find out how I felt in this work environment. I had the feeling that with a degree in Communication I still lacked the foundations to be able to enter the corporate world so I decided to look around for a master that fitted in with my strengths, that was well placed in the business school rankings and that was in English. With all sincerity, I can safely say that thanks to the master, I was able to enter the Freixenet Graduate Programme; I passed all the tests and felt prepared to take on this new challenge. What are your current career plans? Currently, I am working with Revlon as EMEA Brand Manager for the CND brand. I am very happy with this promotion because it is one of the company’s brands that I like the most and in an international environment. For the time being, I want to spend some years learning and to accomplish big achievements with CND and, like all professionals, I hope to continue growing in the future. What aspects of the programme would you highlight? Two of the elements of the programme that I consider most important are, on the one hand, the high level of the faculty. The classes were taught by professionals in the sector and involved practising with real company case studies. This helped me to come to grips with the day-to-day reality inside companies and learn at the same time. Secondly, the international profile of the students. If you want to work in an international environment this master is ideal because you have to spend a lot of hours with people of different cultures and this teaches you how to deal with diversity. How is it different from other programmes? One of the differences is the skills programme taught at EADA´s Residential Centre in Collbató. In these sessions they taught us the more ethical and human facets of being a professional. I think that many business schools forget about this part when in fact it is one of the most important. Pablo Padilla: "The master made me realise my passion"